The Seniors Book Club will meet at 2:00 pm on Wednesday, October 11 in the Training Room to discuss Who Has Seen the Wind by W. O. Mitchell. When W.O. 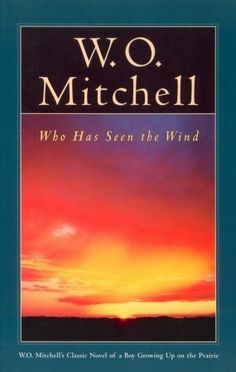 Mitchell died in 1998 he was described as “Canada’s best-loved writer.” Every commentator agreed that his best – and his best-loved – book was Who Has Seen the Wind. Since it was first published in 1947, this book has sold almost a million copies in Canada. W.O. Mitchell, the only Canadian author recognizable by initials alone, was born in Weyburn, Saskatchewan in 1914. Educated at the University of Manitoba, he lived most of his life in Saskatchewan, Ontario, and Alberta, where for many years he was the most renowned resident in High River. During a very varied career Bill Mitchell travelled widely and was everything from a Depression hobo to the fiction editor of Maclean’s. A gifted teacher, he was visiting professor at the University of Windsor for several years, and a creative writing instructor at the Banff Centre for many summers. W.O. Mitchell died in Calgary in 1998.